CB Radio can be the ideal communication method for those on caravan trips, days out or motoring holidays...! 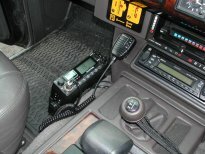 The use of CB radio among caravanners is becoming more and more common, mainly due to the declining number of general users (meaning far less idiots to interupt or overhear you), and the many different advantages that CB can bring. With a vehicle-to-vehicle range of 4-6 miles in average terrain (much more from high points) CB will allow a group of vehicles travelling together to easily keep in touch, whether it be for chit chat between the cars, or co-ordinating stops and finding your way on unfamiliar roads. With CB radio, what is said by one person is heard by all those in the group who are listening on the same channel... What is said by one person in the group is heard by all the others - excellent for important information ("lets take a break at these next services" etc) and for pasing the time on a long journey with inter-car quizes, banter and conversation! With CB radio you can often get traffic reports on the major roads and motorways from truck drivers on the mobile "calling channel" (channel 19 on the UK band). Although the language on this channel can be a bit ripe - this is an excellent reason in it's own right for having a CB. A traffic report for the road 10 miles ahead of you is likely to come from someone on the opposite side of the carriageway who has just driven past the very stretch of road you want to know about! This is quicker and more accurate than relying on local radio or Trafficmaster and even gives you the chance to ask for information on alternative routes and to ask for directions in unfamiliar towns. CB can be very easy to install, especially if it's a temporary set-up for a holiday or weekend away - maybe a 2 minute job... plug the set into the cigarette lighter and place a magnetic mounting aerial on your roof! To get yourself up and running you will need a CB set, an aerial fixed to the vehicle or and a lead to connect the two! Hopefully the information on this site and in our paper catalogue will give you a insight into what equipment might be best for you, but please feel free to email or phone us if you would like us to suggest a system for your needs and budget. As with a lot of things today, you do get what you pay for although in truth there are no "bad" CB's made now - what you do get when you spend more is general build quality and increased life expectancy of the equipment. Having said this - there are certain CB's that are better than others and this doesn't automatically mean the most expensive! We have our proven favourites that we know will give problem free service (the Midland 48 Excel pictured is a good example of this) but we stock them all! A budget CB may well transmit as far as a more expensive unit but the sound quality (both transmitted and received) might not be so good. The more expensive sets tend to use better switch-gear and controls, so you would expect them to last a bit longer than a budget set - especially if used intensively. In truth, the one piece of the jigsaw that makes the most difference to performance is the aerial - and as a general rule-of-thumb, the larger an aerial is, the better it will work. This isn't to say that you will need a huge flagpole sitting on the top of your car - in fact most of the smaller aerials are capable of the 2-3 miles that you might need for road convoy use, most of the time you will be much closer but there will be times when you get spread out more and 2-3 miles should cover this adequately. As ever, if you would prefer it if we recommend a suitable aerial or package for you, just get in touch - we can discuss what you need and can advise on what might suit you best. All of the aerials here use some kind of coil in them, as they actually need to be 9' long or more to work properly. Obviously none of these are physically 9' long (although we can supply them this big! ), so they use a coil to make up the rest of the length needed. 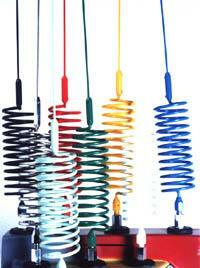 An average 4' long aerial would have a 4' thin steel whip and a loading coil with the other 5' coiled up inside. These aerials have an open coil which becomes a big spring so they are extremely flexible and will bound around all over the place, and will lean back at an angle at motorway speeds. There are two versions of this aerial, a full size (about 160cm) one and a smaller one (about 80cm) which is slightly more rigid. There are three sizes available, 2', 3' and 4' and this design has been around for a very long time! Made in the USA and a good price too. The Mythos 9000 is a high performance aerial that will transmit further and hear more than almost every other aerial available. This is because instead of being 9' long (including the coiled up bit) - it is actually 34' long, although with a physical size of around 4' ! This makes it much more efficient. 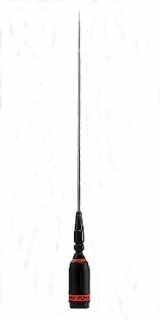 It is manufactured in Italy by a company called Sirio who are well known for their quality products and this aerial is well made and should give years of service. It is almost entirely black in colour with a black painted steel whip. The Sirio Hi-Power 3000 & 4000 are the best vehicle aerials you can get, for sheer performance. There are two versions - the 3000 is approximately 1.8m and the 4000 just over 2m, so they are both large aerials! They are also different from the aerials above, and indeed most of the aerials available, in that they have a different mounting arrangement. This is an excellent way of mounting either permanently or temporarily but especially if you just want to have the aerial on for a week away or a particular event. All the magnetic mounts we supply come with cable and plug attached - all you have do do is put them on the roof, screw the aerial on and plug it into the set. Bear in mind that magmounts will only work if your roof is steel, so fibreglass roofed/cabbed vehicles and most Land Rovers wont be able to use them. The only way you can get damage from using a magmount (and this damage can be very dramatic!) is if you try to use a magmount that is too small for the aerial, or by using an unsuitable aerial. 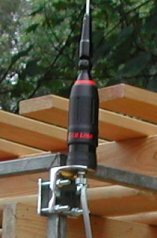 The rigid types of aerial, like the "Firestik" are not suitable for magnetic mounting - they have no give in them, and are too thick - making too much wind resistance. If you purchase the equipment from us - we will ensure that you have a mount and aerial that are suited to each other, and that they will be safe at non-towing motorway speeds (i.e. 70-80mph), so you will have no problem at all at towing speed. This can be a good way of mounting if you have a utility vehicle with a roofrack - the aerial mount can clamp around an upright or horizontal piece of the rack. 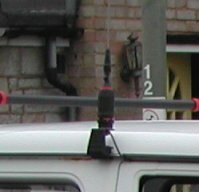 Usually when mounting on a metal roofrack - the size of the rack will be enough to act as the ground, and no "connection" with the rest of the vehicle is necessary. For mounting on roof bars, you will need to make sure that they have a good contact with the rest of the vehicle - the aerial needs a connection to ground (a large metal object will do the trick - in this case it's your vehicle) to work properly. If not, you could use our "Electronic Ground Plane" to simulate a ground connection for you. Mounting this way, you will have to run the cable along part of the rack, so remember to use cable ties or similar to prevent the cable coming loose or snagging on anything - and you will need to run it inside the passenger compartment somehow, through the door opening or similar. 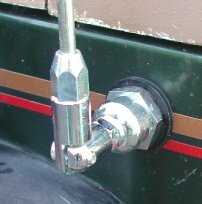 The mounts that will go onto your roofrack are called "mirror mounts" as they are originally designed for fitting to the mirror arms on HGV vehicles. These mounts are adjustable for angle in most directions allowing you to fit them on sloping surfaces and still get your aerial standing upright. They are supplied with a protective rubber pad to prevent any damage to the paintwork. The most popular ones are called dome mounts, and there are versions to cater for the different mounting connections of all the aerials we sell. There are other types too, called stud mounts which can also be used for surface, bracket or plate fixing. All of our CB sets come complete with a power cable, usually 4'-6' long, and they all need a connection to the 12v power in your car. You can run the supplied cable to a connection on the fusebox or straight to the battery, or patch into the power feed to the car stereo. You can put a cigar lighter plug on the lead (or we can fit one for you) and simply plug it into the cigar lighter plug. You will need to make sure that it is well secured - just in case of an accident. You would NOT want a heavy, sharp-edged metal box flying around the passenger compartment with you if youn were involved in an accident. With safety issues in mind - it may be possible to jam the set between seat and transmission tunnel, padded out with a jumper or similar, or to cover one side of the CB with heavy duty Velcro strips and stick this to the carpet somewhere around the cabin. If you have an questions, or would like a bit of extra advice regards choosing or fitting - you can always call us - 01306-881137... we are happy to help. What about an aerial on the Caravan itself? If you are in a group that places a high emphasis on social interaction and friendship then why loose the ability to all chat together from within your vehicles, just because you're no longer sitting in your car? You could have a seperate CB within the 'van or simply remove the car unit and bring it inside. The main thing to get right is the aerial... If you remember earlier i spoke about an aerial needing a connection to earth, or ground - well, getting a ground on a GRP or similar non-conductive contruction caravan could be difficult. Luckily, there is a natural solution to this - marine CB aerials. They are designed to be used on boats, which are also often not metal, so most of the marine aerials have a built-in Electronic Ground, meaning you don't have to worry about a metal-to-metal connection for the mount. They are often supplied with a foldover mount so could be mounted on the roof and kept folded over when not in use, and just brought upright when needed. Another option would be to use any of our standard vehicle aerials with an Electronic Ground Plane on a small bracket.